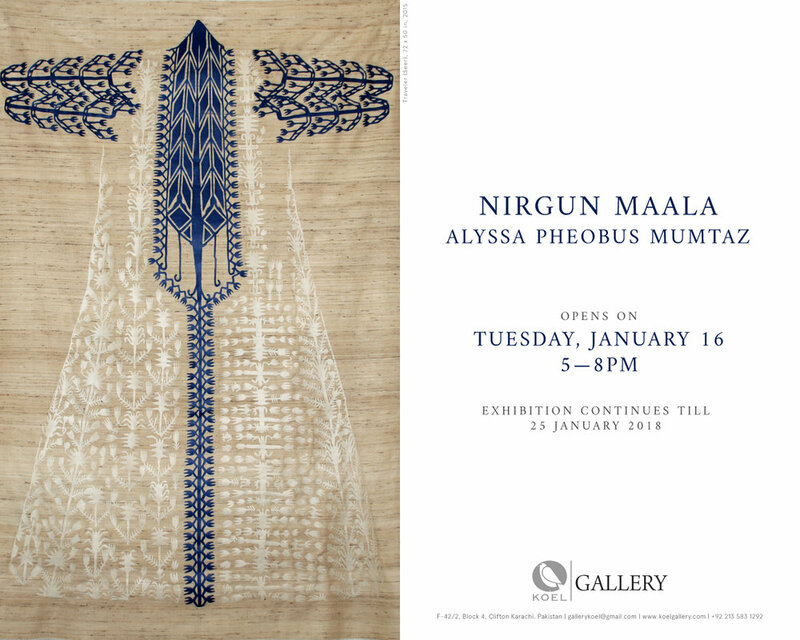 I am pleased to announce the opening of Nirgun Maala, my first solo exhibition in Pakistan. Presented by Koel Gallery in Karachi, the project includes paintings and drawings on paper as well as some of my large scale textile collages. The work assembled in this exhibition springs from my engagement with the South Asian devotional imagination. Comprised of four distinct series, it obliquely reflects the contemplative concept of simran: perpetual concentration on the Real. This constellation of works also meditates on an integral metaphysical thread that connects Indic religious traditions: the mystery of an absolute nirgun reality that transcends form while, simultaneously, manifesting itself through form. This tension between the essence, naam, and outward appearance, rup, is often represented in devotional poetry through the symbol of the maala, the string of rosary beads common to Hindu, Buddhist, Christian and Muslim devotional practices. The maala is also an apt metaphor for the contemplative character of my work: like the turning of the beads, my cyclical practice periodically loops back on itself, revisiting forms and images that have become objects of concentration. In a popular poem well known by qawwals and bhajan singers alike, Kabir Das ecstatically proclaims his gratitude that his maala is finally broken. This evocative image was the point of departure for Constellations, a series of paintings in which a single string of prayer beads is depicted in the process of breaking open, shedding its limitative form. Characters, a parallel group of tasbihs drawn in black indigo, playfully imitate calligraphic forms or ink blots, suggesting dynamic states of soul. Travelers, a pair of elaborate, embroidery-like collages composed on the surface of handloom silk, complement the intimate works on paper. Referring to the patched and embellished khirqa robes worn by wandering mystics, the abstracted floral imagery of these works echoes the Sanskritic origin of the word maala, which also signifies a garland of flowers. A fourth project, a series of delicate pencil drawings depicting Looms, meditates on the acts of weaving and unraveling. These images pay homage to Kabir’s loom and the invisible grid that governs the coalescence and dissolution of all forms.